The Mobile World Congress is a truly unique opportunity to reach out and network. What’s more, it is an opportunity to send out important messages to the international community. Although North Rhine-Westphalia (NRW) is one of the world’s leading places for the mobile industry, only few insiders know about it. This got to be changed with our NRW country pavilion. Our federal state is one of the primary locations as it is home to three out of the four German network operators: Deutsche Telekom, Vodafone and E-Plus (KPN Mobile). It is also the German base for suppliers like Ericsson, Nokia and Nortel. Almost more important it is the focal point for many innovative small and medium-sized businesses in this industry. 100.000 of 140.000 people working in the German mobile sector are located in North Rhine-Westphalia and Germany is the largest telecommunications market in Europe. 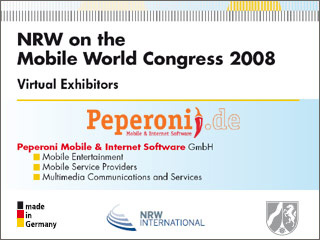 Our goal is to put NRW on the international mobile business map. We are presenting a range of companies showing the diversity of the mobile industry in our country. Welcome to the Stand of our country pavilion of North Rhine-Westphalia. Dr. Bettina Horster, Director M-Commerce eco e.V. Harald A. Summa, CEO eco e.V. Weiter → Nächster Beitrag: Is it a Micky Mouse or Matylda? congratulations..you are willing to come to Barcelona..but i discussed with you something about ..coming to make a conference to my university in portugal..and you couldn´t understand my idea..???? i´m sorry if i seemed a defensive..or rude to you..
i have already sent you a e-mail..to explain..
i´m very glad you didn´t considered me a crasy person..
since you are going to this congress..think about coming to portugal..to do business..